The My Reports tool helps marketing specialists gather all the necessary data into one customized report and share it with their bosses and clients. This tool really saves time by updating information automatically. 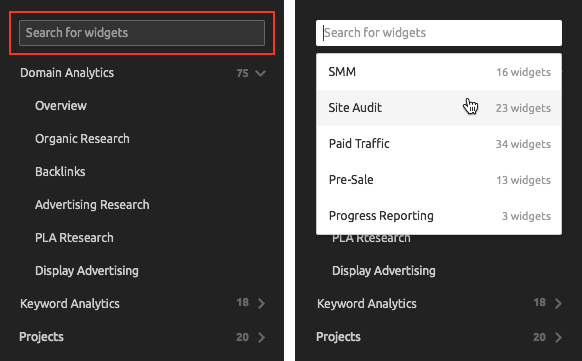 We at SEMrush keep embedding new widgets into the Report Builder to make your reports more rich and detailed. The good news is that you can now collect your favorite widgets in one place and easily find any widget in the search bar! Let’s say you create a lot of reports using the same widgets and are constantly searching for them in the menu. Now there’s no need to repeat the same tedious work. Simply click on the star icon beside all your favorite widgets and they'll be added to the Favorites section. Because the Report Builder already features over 200 different widgets — and this number is constantly growing — sometimes it takes some time to recall the name of a particular widget and a section it hides in. No more hide and seek! We’ve embedded a Search bar at the top of the menu, where you can type in the name of any widget and find it in one click. 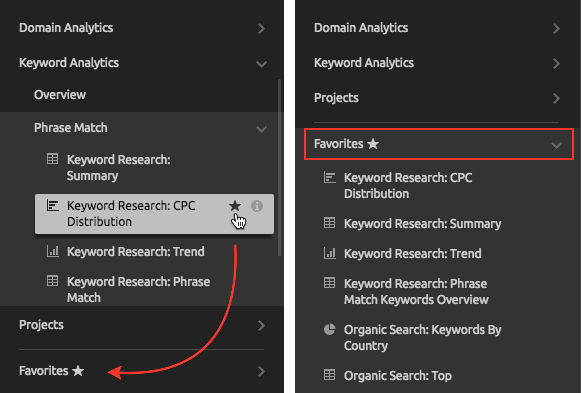 The same bar features presets that will surely simplify your search. Pretty handy, right?